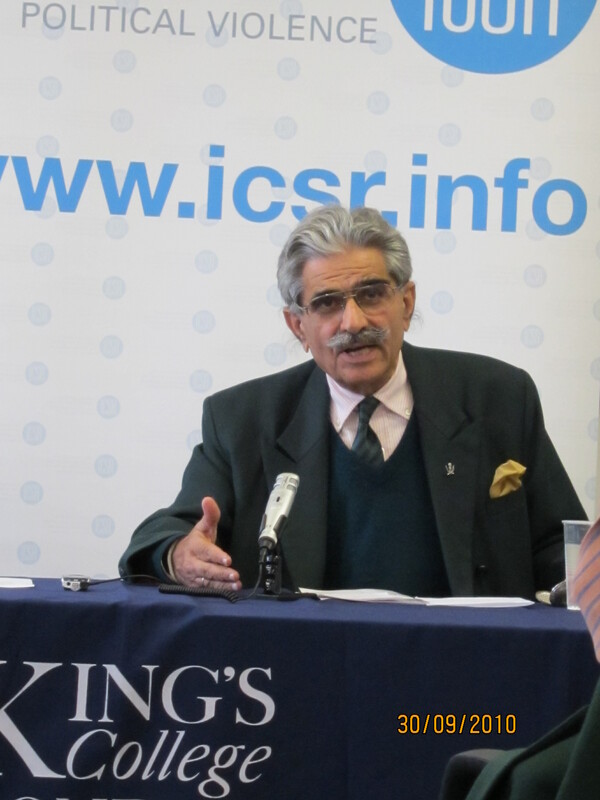 Yesterday, ICSR hosted Gen. Ashok K. Mehta, where he discussed the intricacies of India’s internal security challenges. Gen. Mehta was commissioned in the Fifth Gurkha Rifles regiment of the Indian Army in 1957. He has taught at the Indian Military Academy Dehradun and Defence Services Staff College Wellington. He attended courses at Command and General Staff College, Fort Leavenworth (USA) and Royal College of Defence Studies (UK). He took part in 1965 and 1971 wars and served extensively in J&K and the North East and UN Peacekeeping in Congo in 1962. His last assignment before taking premature retirement was GOC IPKF (South) Sri Lanka. He is founder-member of the Defence Planning Staff in the Ministry of Defence. Throughout his talk, Gen. Mehta stressed that India’s internal security challenges are far more complex than their external ones, and that the country’s pre-occupation with the threat from Pakistan has taken away focus from emerging internal threats. Although he conceded that the main security threat emanates from Pakistan backed jihadist militants from Jammu Kashmir in the North East, the General noted that thus far the government has failed in its ‘carrot and stick’ approach to Maoist rebels. The Maoists, described by India’s Prime Minister as the country’s greatest internal security threat, currently control over 40,000 square kilometres along the south-east coast of the country and have a presence in 20 of India’s 28 states. A force approximately 10,000 strong, they are primarily a rural insurgency based in the forests and tribal area. Additionally, they raise roughly £150m a year and are often better armed that Indian security forces. Adhering to an ‘anti-development’ ideology, they have destroyed around 40 percent of India’s railway business and other crucial aspects of the country’s infrastructure. Unlike jihadist militants, the Maoist threat is ’99 percent internal’ and receives little assistance from outside the country. Among Gen. Mehta’s primary concerns in the fight against the Maoists was that, despite their constituting a ‘fully-fledged insurgency’, there is little to no co-ordinated effort between Indian states to combat the there, with each state essentially acting independently of the other. In order to properly address this problem, the General concluded by recommending the creation of an official body, based on the American Department of Homeland Security model, which could properly co-ordinate a response.